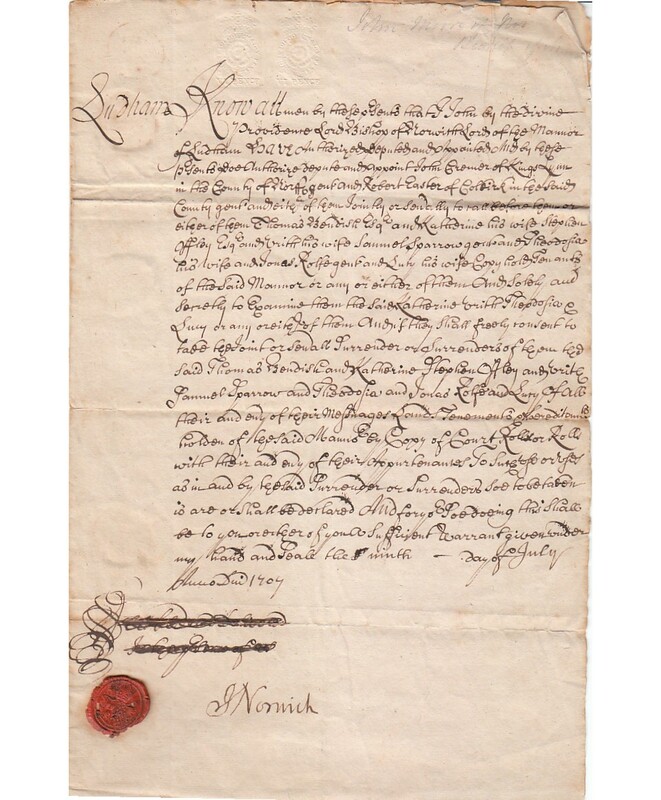 Manuscript Warrant Signed ‘J Norwich’ as Bishop of Norwich, relating to the surrender of leases at Ludham (near Great Yarmouth, Norfolk). 1 page 12 x 7½ inches, folds, minor marginal tears, in clean condition, Moore’s personal seal in red wax affixed. 9 July 1707. John Moore (1646–1714) was an English cleric, scholar, and book collector. He was Bishop of Norwich (1691–1707) and Bishop of Ely (1707–1714). At the time of his death in 1714, Moore’s collection of books and papers contained over 30,000 items, and may have been the largest in England. To celebrate his coronation, King George I caused it to be purchased intact, at a cost of 6,000 guineas, and donated to Cambridge University. Moore’s library alone contained nearly twice the material in the existing University library. While some material has been removed over the years, the gift is still largely intact, and is called The Royal Library in honour of its patron.